Hei, kuukauden ensimmäinen sunnuntai! Tervetuloa syyskuun Penny Black and More haasteen pariin. "Kaikki käy" kunhan pääosassa on leimattu aihe! Suloiset siilet pääsivät mallikorttiini. Easy peasy theme as "anything stamped goes", and the stamped one needs to be at the focus . We have some fabulous prices again, so please follow the rules that are so simply! A lovely card Mervi, it's such a cute image and the warm colours give a lovely Autumnal feel. Tosi kaunis ja :) aivan ihana antaa vaikka hyvälle ystävälle! Yes, the paper does make you think of a bandana. But it's pretty and decorative and suits this hedgehog design. Cute! This is just adorable! Beautifully done! Gorgeous creation, lovely image and wall the gorgeous red. Adorable card Mervi. Super cute Hedgehogs. Gorgeous card Mervi! The image is so cute, it's just perfect for our challenge. So cute Mervi - love your colouring. 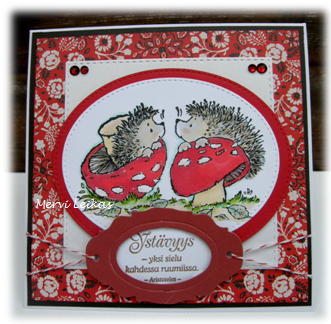 Such a cute card, love those hedgehogs! Thank you for joining in The Craft Barn Challenge.